Obituary – Shaw, Thelia Kay (Sewell) « Perry High School Alumni Association, Inc.
﻿Red Hots ’58-’61; Red Hots President ’59-’60; F.T.A. ’59-’61; Glee Club ’58-’61; Girls’ Trio ’59-’60; Girls’ Quartet ’58-’61; Mixed Quartet ’59-’61; Junior Play ’59-’60; Christmas Vespers ’58-’61; All School Revue ’58-’61; Singorama ’59-’60; Spanish Assembly ’59-’60; Annual Staff ’58-’59; Football Queen ’59-’60; Home Room President ’59-’60; Honor Society ’58-’60. Thelia Kay Sewell Shaw, 62, passed away in Norman July 27 after a lengthy illness. Services will be held at 10:00 A.M., Saturday, July 30, 2005, at First Baptist Church, 211 W Comanche, in Norman, with Reverend Tollie Bibb officiating. The family will be at the funeral home from 6:30-8:00 Friday evening. Interment will follow at 4:30 P.M., Saturday, at Keith Cemetery, southwest of Burlington, Oklahoma. Services are under the direction of Havenbrook Funeral Home of Norman, Oklahoma. Thelia was born in Shattuck, OK, July 3, 1943, to John and Zola Sewell. She graduated from Perry High School, received her BS in music education from Southern Methodist University, her Master’s in Guidance and Counseling from Oklahoma State University and her PhD in Guidance and Counseling from Kansas State University. After teaching vocal music in North Kansas City, MO, she served as a counselor at Boy’s Town in Omaha and as a school counselor in Stillwater, Norman, and Richmond, CA. She married Terry in 1975 and had two children, Tarren and Tana. Music was an important part of her life. 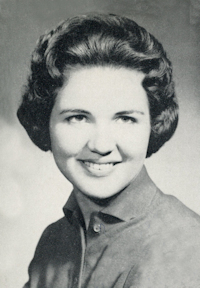 She was the national song leader for Kappa Delta sorority. She directed church choirs in Kansas City, Manhattan, KS, Stillwater and Norman, and was a member of the Norman First Baptist Church choir. Thelia was President of the Oklahoma School Counselors Association, co-authored a children’s book and teaching materials to help children cope with the Murrah Building bombing and was selected as the Oklahoma Counselor of the Year by the Oklahoma Counseling Assn. in 1995. She served on the board of directors of Big Brothers and Big Sisters. Her greatest gifts involved her genuine interest in every person she met and her desire to serve others. She was able to use these gifts in her career as a counselor. Thelia is survived by her husband, Terry; son, Tarren; daughter, Tana; sister, Julia and husband, Gerald Payne; sister-in-law, Gwen Shaw; sister and brother-in-law, Dixie and Greg Thomas; and seven nieces and nephews. Her parents, and her brother, John Sewell precede her in death. Contributions in her memory may be made to the Leukemia and Lymphoma Society, 500 N. Broadway, Ste. 250, Oklahoma City 73102.